Now this is a home fit for a champion. 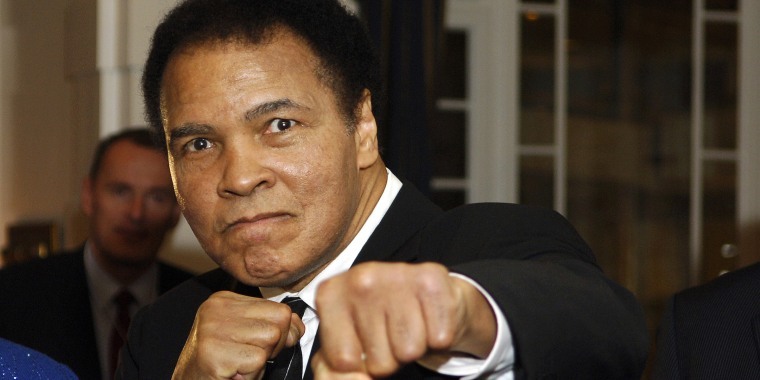 Boxing star Muhammad Ali’s former Los Angeles mansion is currently on the market, and it’s giving us insight into how the legend once lived. The nine-bedroom, seven-bathroom home sits on 1.6 acres of lush green land set behind the private gates of Fremont Place, a historic neighborhood filled with massive and luxurious mansions. Dating back to 1916, the house features the original ornate fireplaces, Tiffany stained-glass windows, and Italian Renaissance architectural details. From the moment you arrive at the front door and look up at the colorful stained glass entryway, you’ll know you’re about to step into something special. Inside, there are rich wooden accents and gilded touches on the walls, plus plenty of sparkly chandeliers dangling from the ceiling of almost every room in the house. One of the living areas features built-in, glass-enclosed bookcases, making it the perfect spot to enjoy a good book . Another sitting area features wall-to-wall windows with tons of sunlight streaming in. The kitchen looks like a good place to whip up a meal for a heavyweight. It’s got rich wooden cabinets, a center island and a large stainless steel refrigerator. For formal gatherings, you can host your friends and family for a meal in the fancy dining room which is topped with a crystal chandelier. One of the home’s seven bathrooms features mirrored walls that reflect the opulent decor. And in the spacious master suite, you’ll find a cozy fireplace and access to your own private terrace. The home also has the perfect place to watch the next big fight on TV. A lounge room features a bar and plenty of space to entertain guests. Speaking of entertaining … there’s also a massive swimming pool, outdoor lounge areas and park-like grounds that would make it a great place to host a backyard party. Want to get your hands on this historic property? It’ll cost you $16.999 million. Rather just dream about it? You can look at more pictures of the house by checking out the listing from Stefani Stolper and Matthew Clayman of Douglas Elliman.